To the honorable Cornelius...judge of the fourteenth judicial district court of the State of Louisiana, holding sessions…and for the parish of St. Martin. That his father William Denyer, late of the Parish of St. Martin, departed this life, leaving some property in community between himself and the following named sisters and brothers, to wit: Elizabeth Ann Denyer, wife of John Pratt, both absent from the State of Louisiana, and the three minors Abenyser Upham Denyer, Jane Goldfinch Denyer, William Sliver Denyer, to whom it becomes necessary that a tutor and under tutor be appointed, according to law. Your parishioner begs leave to state that being one of the brothers of the aforesaid minors he ought to be appointed to their tutorship….. Your parishioner further suggests the propriety of appointing a counsel to Elizabeth Ann Denyer, wife of John Pratt, one of the heirs of William Denyer deceased, and who is absent from and not represented in the State of Louisiana. 1) I use ellipses where I have difficulty deciphering the handwriting, and I stop prior to the bottom paragraph. The document continues on to the next page, and there are 47 separate pages in the folder. It's going to take some work to decipher it all. While I am somewhat interested in the details, this page is sufficient to confirm that it is my ancestor, as well as provide a more exact location for his death than I had previously. He was born in the county of Southampton, Hampshire, England, November 22, 1794; died in Louisiana, March 14, 1848. In early life he was a cabinet maker in Baltimore, Maryland. After marriage he was a farmer in Bucks County, Pennsylvania, later he burned lime from oyster shells, in Philadelphia, was in ice business, rafted lumber down the Schuylkill river, boated on the Schuylkill canal, run saw and grist mill in Lycoming County, Pennsylvania, and engaged in whip-sawing at New Albany, Indiana. 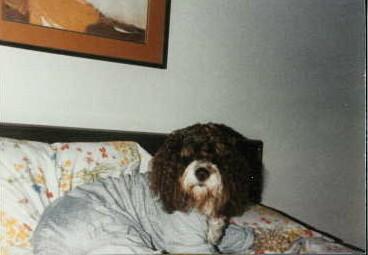 While there he was taken sick, and went to Louisiana for his health. In 1839 he settled with his family near Brazoria, Texas. In 1840 he moved to Gonzales County, Texas, and in 1841 to Louisiana, and traveled as an itinerant minister of the Methodist Episcopal church, until his death. 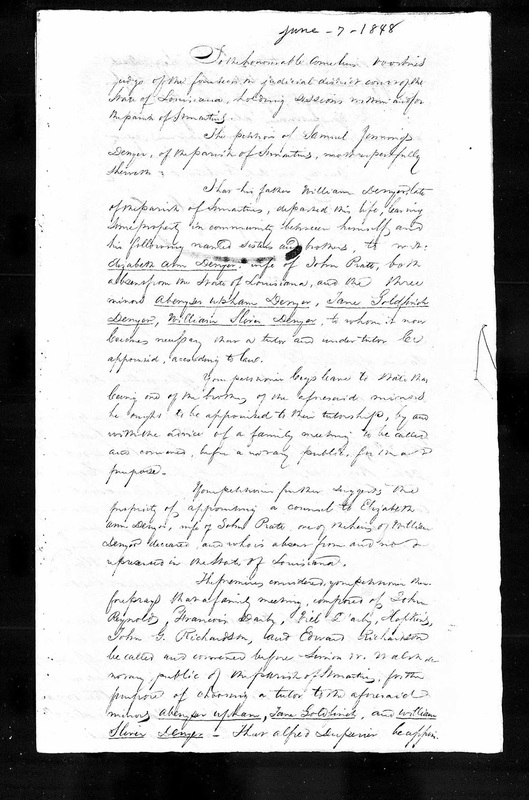 This document confirms his death in Louisiana in 1848, and provides a parish. 3) I have maintained the unusual spelling of the name of my second great grandfather, Ebenezer Denyer. His middle name is elsewhere, Ophan, which seems less likely than Upham, but is a religious term that might not be unfamiliar to an itinerant minister. This week's image prompt was taken in 1931 outside the Vanderbilt mansion. 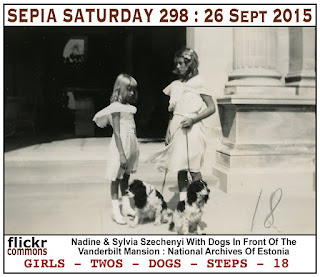 It shows two daughters of Gloria Vanderbilt and Count László Széchenyi, along with two dogs. The dogs aren't named, and I haven't been able to verify if they belonged to the Széchenyi family. 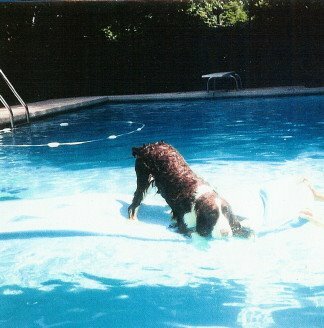 They are almost certainly English Springer Spaniels, a breed with which I am very familiar, as I grew up with several. Forgather’d ance upon a time. Count László Széchenyi (1879-1938) was Hungary's first minister to the United States. My maternal grandfather, Martin Deutsch, was born in Hungary. (The town in which he was born is now part of Romania.) 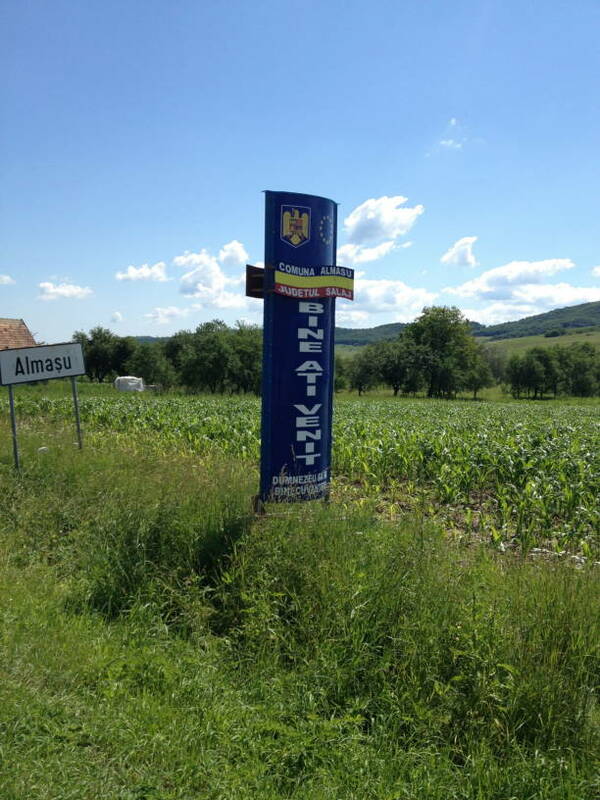 I visited a few of the villages of my Transylvanian ancestors back in 2012. 2) The building my great grandmother, Helen (Lichtman) Deutsch grew up in. 2012. (Margitta, Hungary; Marghita, Romania.) 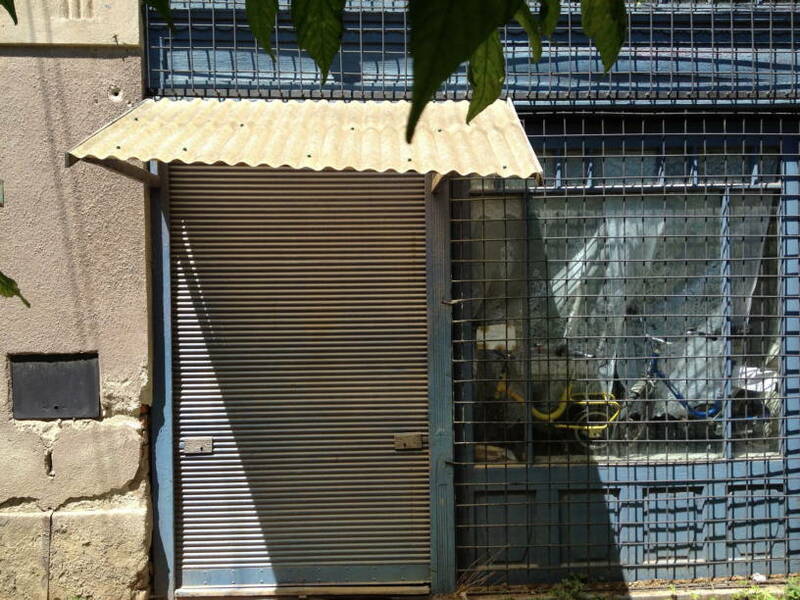 It served as a home, and a place of business for her family. A different family now lives there. Excerpt from: The People, Yes, Carl Sandburg, 1936. 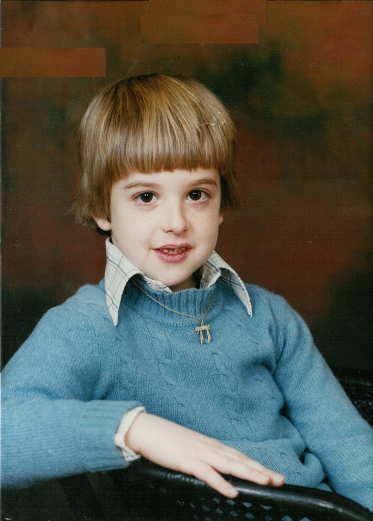 Here's a photograph of myself, age 8, after receiving a 'Chai' necklace for a birthday gift. Update: Further research indicates this is not my wife's ancestor, but an individual with the same name, and same year of death. St. Louis, May 24th 1911. I appoint my wife Lulu N. Wallace sole Executrix without bond. I direct that all my just debts be paid. I direct that 5000.00 in Cash be paid to my mother B.S. Wallace. 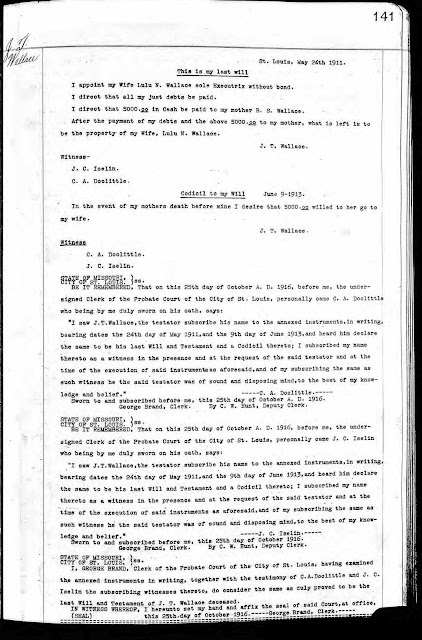 After the payment of my debts and the above 5000.00 to my mother, what is left is to be the property of my Wife, Lulu N.Wallace. In the event of my mothers death before mine I desire that 5000.00 willed to her go to my wife. Sworn to and subscribed before me, this 25th day of October A.D. 1916. George Brand, Clerk. By C.W. Hunt, Deputy Clerk. I, GEORGE BRAND, Clerk of the Probate Court of the City of St. Louis, having examined the annexed instruments in writing, together with the testimony of C.A. Doolittle and J.C. Iselin the subscribing witnesses thereto, do consider the same as duly proved to be the last Will and Testament of J.T. Wallace, deceased. IN WITNESS WHEREOF, I hereunto set my hand and affix the seal of said Court, at office, this 25th day of October, 1916. George Brand, Clerk. 1) Found in Ancestry's new Will and Probate collection, this is clearly not the original documents. 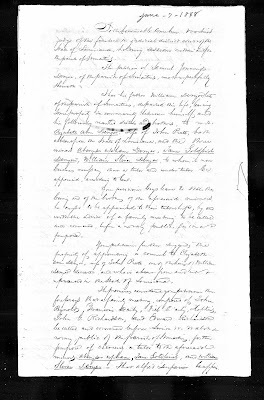 Someone possibly transcribed the Will and Codicil in October of 1916 along with the testimony of the witnesses. 3) J.T. Wallace refers to his mother as B.S. In the 1870 census she is listed as "Frances" and on J.T. 's death certificate, she is listed as "Eliza." Elizabeth could be abbreviated as both Eliza and Beth. I don't have a death date for the mother, though the codicil suggests she was still alive in 1913. While they lived in Missouri, and death certificates 1910-1954 are online, Wallace is a very common surname, and there are multiple possibilities. 4) As I have been researching the past several years, I have grown to loathe the use of initials. I noticed this week's image comes from the Missouri State Archives. 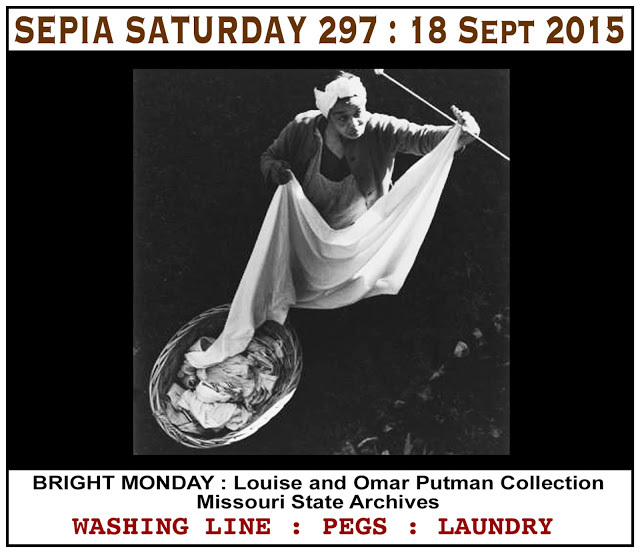 I also recalled seeing washing lines in photographs from the 1908 report bythe Civic League of St. Louis on the housing conditions in the Carr Square tenements. I have several ancestors who lived in or very near to the neighborhood, before and after the report. I'm not entirely sure how the washing lines between the buildings worked. I'm guessing there was a pulley system. Here's a photograph of my great grandmother, Margaret (Denyer) Vanevery. She is outside of her El Paso, Texas home. 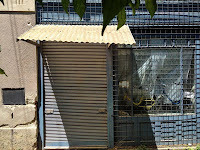 I believe a washboard can be seen leaning against the house. 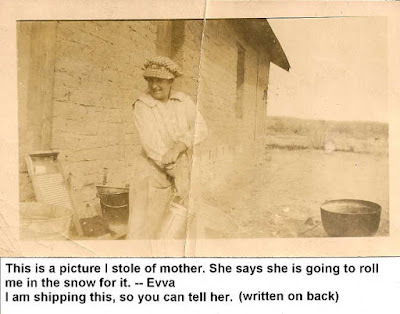 It was probably taken in the early 1920s. Evva (or Evelyn), the photographer, mailed it to her sister, Myrtle, my grandmother. 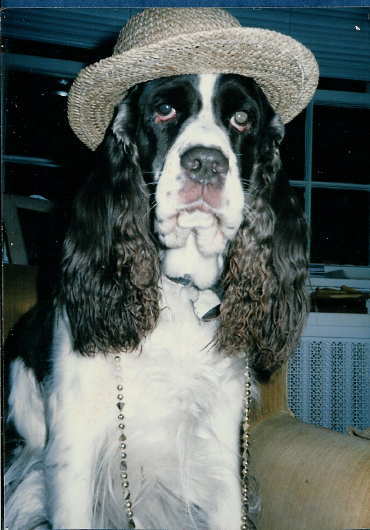 Myrtle moved to St. Louis in 1920. Margaret died in 1923. Like many genealogists, I have delved into Ancestry.com's recently released database of wills and probate records. One will I have found is that of Archik Kruvand (1871-1926). He was the nephew of my second great grandfather, Moshe Leyb Cruvant, and also immigrated to St. Louis from Lithuania. I, Archik Kruvand, being of sound mind and disposing memory do hereby make, declare and publish this as my Last Will and Testament, hereby cancelling and declaring null and void all previous Wills, Testaments, Codicils etc. To each of our children hereinafter mentioned I hereby give, devise and bequeath the sum of ONE ($1.00) Dollars, namely: Harry, Julius and Gootman Kruvand. All the remainder and residue of my estate, whether real, personal or mixed I hereby give devise and bequeath to my wife Minne Kruvand, for her sole use and benefit forever. I hereby appoint my said wife Minne Kruvand, as sole exeuctriux of my estate without being required to furnish Bonds, and with full power and authority to sell, mortgage or in any manner dispose of the whole or any part of my estate. Witness my hand this 6th day of April, 1926. Signed, published and declared by Archik Kruvand, testator above named as and for his Last Will and Testament, in our presence who at his request in his presence and the presence of each of us, who have hereunto subscribed our names as witnesses thereto the day and year first above written. Sworn to and subscribed before me, this 28th day of September 1926. George Brand, Clerk. By Fred H. Haid, Deputy Clerk. 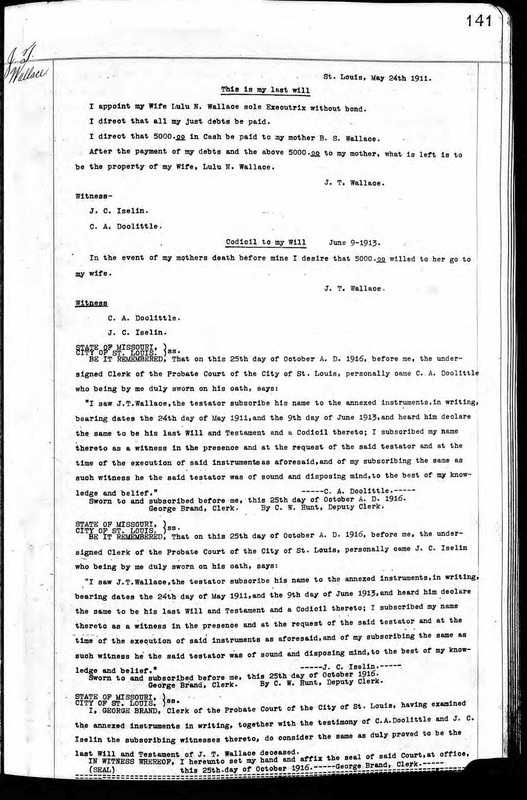 Be it Remembered, That on this 28th day of September, A.D. 1926, it being one of the days of the September Term of the Probate Court of the City of St. Louis, for said year, an instrument in writing, purporting to be the last Will and Testament of Archik Kruvand deceased, is produced in and exhibited to said Court, upon examination whereof, and of the testimony of Philip Steinberg and David Deutsch the subscribing witnesses thereto, it is considered by the Court that said instrument in writing is duly proved to be the last Will and Testament of said Archik Kruvand, deceased. Witness, George Brand, Clerk of said Court, and the seal thereof, at office, this 28th day of September 1926. 1) There isn't a lot of new genealogical information here. I suspect Philip Steinberg is a relative of Archik's wife, Minnie, and will conduct some research to verify this. I am unsure how David Deutsch is related, if at all. 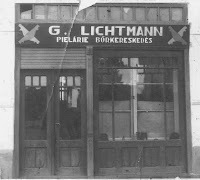 2) Gootman (or Gutman) Kruvand remained in Lithuania, and was a victim of the Holocaust. It is unclear why he remained and didn't immigrate with his family. Records suggest he was born in 1902 and Archik and Minnie immigrated in 1913 or 1914. His younger brothers were born in the US. It is possible he had a different mother. 3) Like most of my paternal ancestors and their immigrant kin, the mark for his signature indicates he was likely illiterate in English. Whether he was literate in Hebrew or Yiddish is unknown. 4) If one were to make an argument for the 'correct' spelling of the surname, 'Kruvand' would probably win, since it is believed to be derived from the town named Kruvandai, Lithuania. (One relative has made the suggestion to me that he was told the town was named after the family, but I find that less likely.) I believe most of the branches of the family thought of the surname in Hebrew, and transliterated phonetically. As you light up your barbecue and enjoy your day off from work (those who have the day off) - take some part of the day to consider the advancements we have made in workers' rights over the last century - Many of us may have ancestors who worked in the coal mines or sweatshops. Also consider in what ways the struggles aren't over. Here's a playlist of songs which may help.